kerala death certificate, marriage and birth certificate can be download from cr.lsgkerala.gov.in. once we have published about downloading birth certificate from cr.lsgkerala.gov.in. 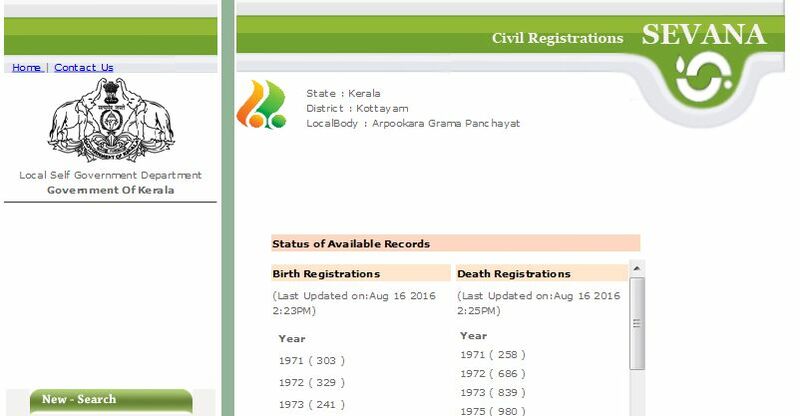 the official registration website for death, birth and marriage is cr.lsgkerala.gov.in. it’s compulsory to register death, birth and marriage in corresponding local bodies. once you successfully registered the details you can download this certificate in pdf later. birth certificate is need for school, college admissions, apply for passport etc. so registering birth, death and marriage is very important. downloading these certificates from the website is very easy. you need to remember just few things like date, place etc. As mentioned earlier we have posted the details of registering child birth and download the certificate etc in the previous post. now you can how can we download kerala death certificate from this website. please be remember that we can only get the details of registered deaths. you can’t download the death certificate of unregistered deaths from kerala death Registration Website. You need the name of the person, date of death and place of death for getting the details. if the death happens in a hospital, you need to select that local body name. for example that person lived in trivandrum, and the dead in a hospital at kollam. in this case you need to select kollam, because the death is registered there. if you know the name, date of death and other details can open the site cr.lsgkerala.gov.in from your desktop or mobile browser. you need to click the certificate search link from home page. please check below screenshot for more details about this step. you will lead to the next page, from here you need to select the corresponding Select the Localbody where the search event (Birth, Death, Marriage ) has been registered. from the drop down menu you can select corresponding options. once you selected these values , it will lead into the next page. this page will display the details of registrations. you need to click on birth or death, if you want to download death certificate click on death. next page will ask you some questions like Name of Deceased , Date of death, gender etc. you need to fill these values to get the kerala death certificate. once you successfully entered the details, it will display the results. from this page you can download death certificate in pdf format and take printouts. check the below image for more details about the same.